Comet ISON ( C/2012 S1 ) on September 14th, 09:29ut. At last I was able to capture it above the forest canopy and just in time before Sunrise, light over exposure. Neg. image 50% enlarged. Raw (unprocessed) Animation At: http://www.jaicoa-observatory.com/C2013 ... im-EMr.gif Time lapse of 20 min. approax. Comet Lovejoy on September 22nd, 08:54ut, Finally the weather improved slightly. A satelite passed by. Image not croped, all Equipment info on image. Comet ISON (C/2012 S1) on September 22nd, 09:23ut. Animation At: http://www.jaicoa-observatory.com/C2012 ... im-Emr.gif .Under improved conditions. Imaged not croped, all Equipment info on image. Comet ISON under optimum conditions but still above the forest canopyon September 27th, 08:27-09:25ut (28min total Exp.) Stacked with astrometrica. Image not croped, Equipment info on image. 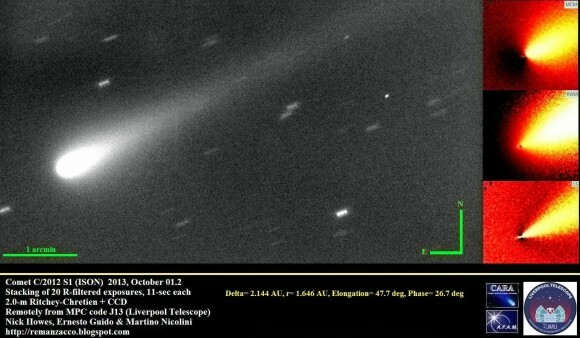 Latest image of the comet ISON just a few hours before its closest approach to Mars. And its motion for 45 minutes relative to the stars. Last edited by hgg on Mon Sep 30, 2013 8:43 pm, edited 1 time in total. Comet Lovejoy C/2013 R1 on September 28th, 07:49ut. Top=LRGB 1min, 30sec. ea. Comet ISON C/2012 S1 on September 28th, 08:49-09:3ut. Geting slightly brighter as time progresses. composed of 44 30-second exposures at ISO1600, stacked using DeepSkyStacker. 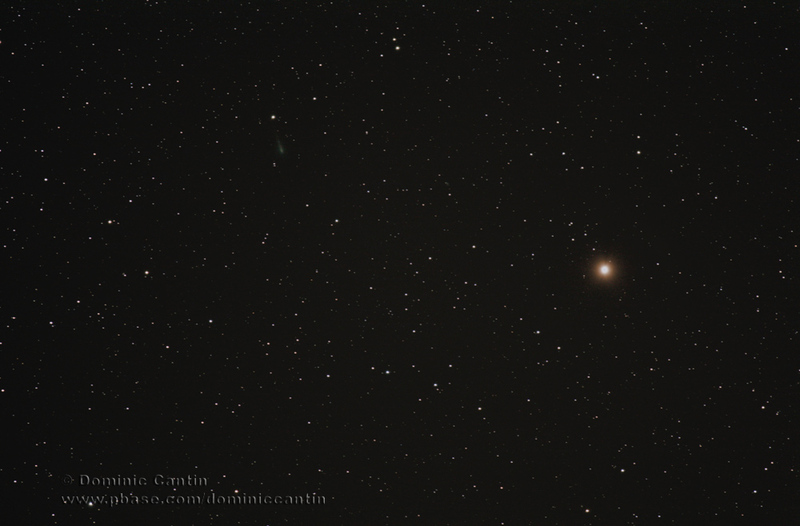 Comet ISON C/2012 S1 on October 3rd under above average conditions. Getting more impressive as time progresses. 7 x 4min. exp. (28min total)Equipment info on image. Comet ISON C/2012 S1 On October 4th, 09:00-09:24ut. (6x4min. Exp.). Above average conditions. (not croped), Equipment info on image. Comet ISON C/2012 S1 On October 6th, 08:51-09:27ut. (36min. total Exp.) Two Galaxies are visible Lower Left image (neg.) They are PGC 1509685 and (top R) PGC 28008. (croped at the edges-Stacking only). Equipment info on image. 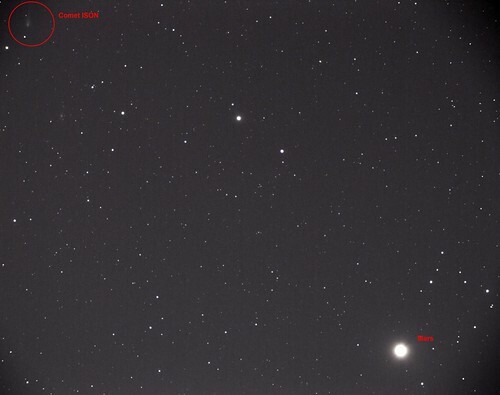 Comet ISON C/2012 S1 with Mars on Sunday October 6th at around 04:00 UT. Taken at the Kelling Heath Star Party in the UK. Imaged with a Canon 350D on a Takahashi Epsilon 180ED astrograph. 4 exposures of 3 minutes stacked together. Comet Encke - Oct 12th. My first photographic try on ISON. Visualy , it takes a telescope to see it because Ive tried with binoculars 10 X 50 and I was not able to see it and I was in a very dark site in the Laurentides Wildlife Reserve ! Fortunately , my camera was able to record this faint comet ! I hope that will change soon as its approach of the Sun. photo details : Canon 1D Mark III , 400mm @ f 5,6 , iso 1250 11 x 2 minutes = 22 minutes total exposure stack in DSS.